In the back Katharina Grosse, Untitled Trumpet, 2015. Site specific installation part of All The World’s Futures, curator Okwui Enwezor’s group exhibition at the center of this year’s Venice Biennale. In the front Nick Cave, “Soundsuit 2009” Human hair, metal armature. In the back, Katharina Grosse, Inside the Speaker, 2014. 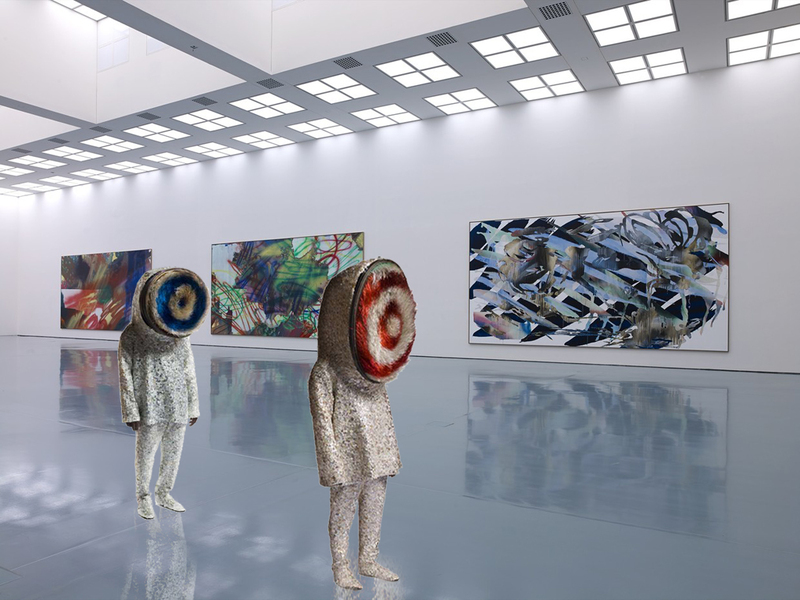 Museum Kunstpalast Düsseldorf , acrilic on canvas – In the front Nick Cave, ” Soundsuit 2010, Mixed media including antique sifter, wire, bugle beads, buttons. 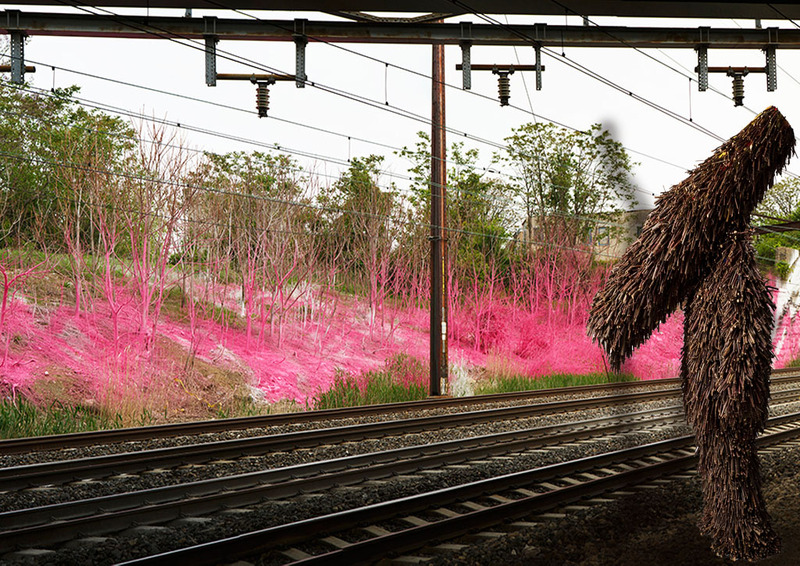 In the back Katharina Grosse, Psycholustro, 2009, presented by the city of philadelphia mural arts program. in the front Nick Cave, Soundsuit, 2007. fabricated with sticks, dried plants and fabric, plus appliqué and embroidery, is reproduced from Nick Cave: Meet Me at the Center of the Earth. Dreamshow is a new concept. How great will it be to imagine a show and be able to project it physically? This concept seemingly utopian as of now is a more and more likely possibility in the future. We’re already encouraging the rise of augmented reality and digital-native artists, who are working to support these technologies. I believe in the future it will eventually be possible to watch an exhibition from our homes with Google glasses or with an app implanted in our skin. We’re going to be “experiencing” exhibitions, concerts and movies. We might also be able to download and choose our favorite artists to create our own Dreamshow playlist. The range of “experiences” can be so broad that one could even include exploring new planets like the recently discovered Kepler452b. That seems like a long time ahead, so let’s settle with the current technology. 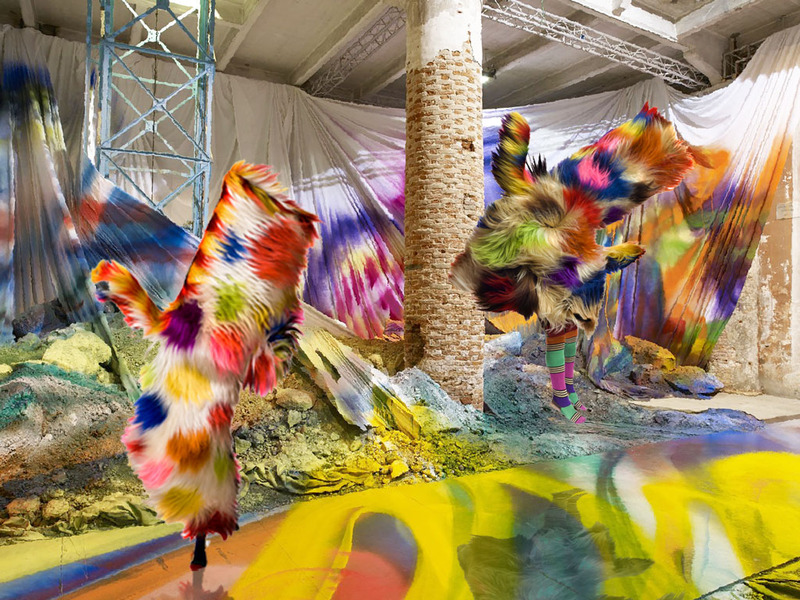 My first Dreamshow includes Katharina Grosse and Nick Cave, together for the very first time. 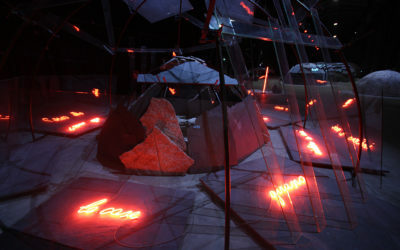 It is a tribute to Art in a dream state and an expression of the interior world. 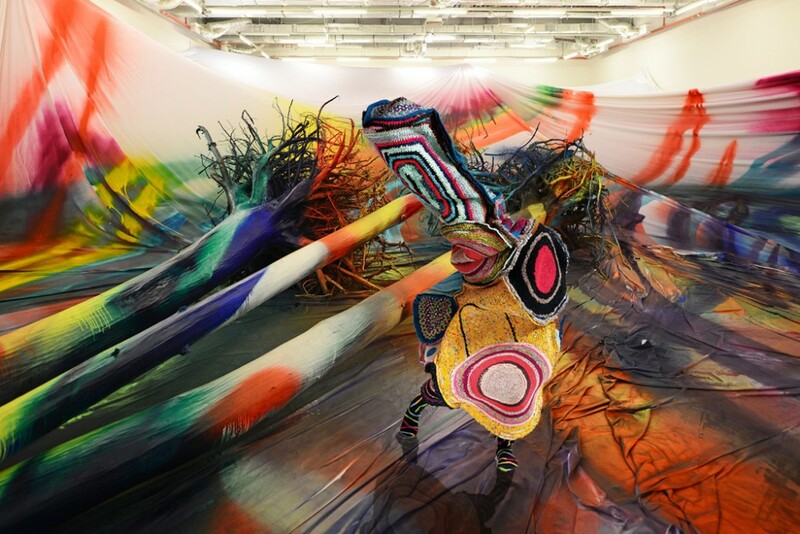 Nick Cave and Katharina Grosse appropriate fragments of reality and everyday life, using abandoned materials and fabrics to build a new aesthetic world. There’s also an explosion of colors from an electric palette. 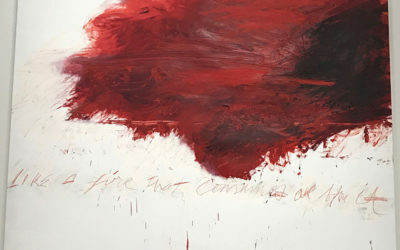 Both these artists’ artworks are inspired from a meditation about, “How limited we are from our boundaries”. They stage their artworks in a way that you can live them, be part of them, and walk in them. It is not escapism. It is a re-imagination of everything by making the conscious, unconscious. Nick Cave is a Chicago born artist. He is famous for his Soundsuits that are wearable fabric sculptures. These soundsuits are a reminiscence of African ceremonial costumes and masks, and are related to the perception of identity. They can be displayed as objects or featured in solo and group movement performances. German artist Katharine Grosse makes large-scale installations using a spray-gun rather than a paintbrush. Her environmental sculptures juxtapose electric colors with layers of materials. 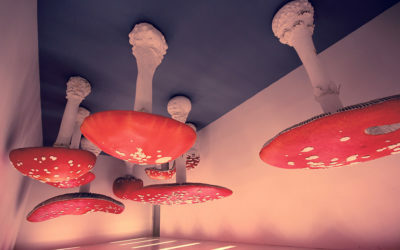 They are immersive paintings. Her work is also currently on view at The Venice Biennial. 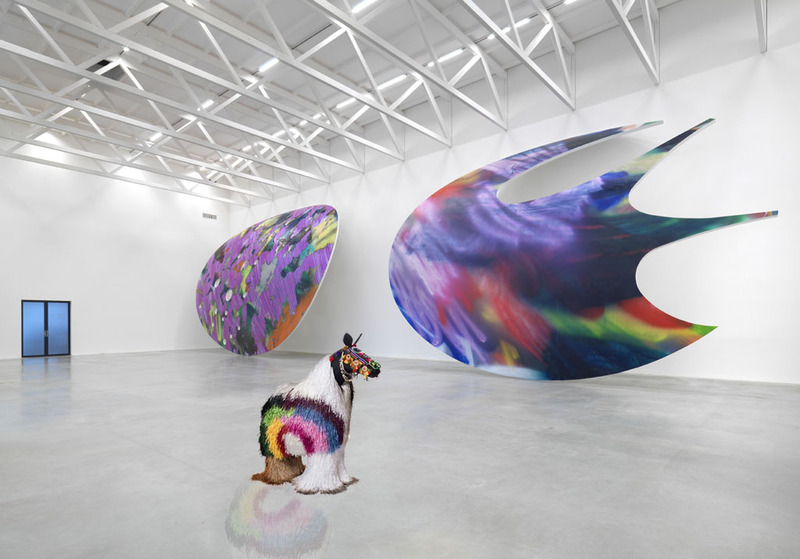 Cover picture; in the back Katharina Grosse, Garage Center for Contemporary Art, 2005, in the front Nick Cave , Soundsuits.